A pretty baptism song done "country" style. Then Laban and Bethuel answered and said, "The thing has come from the Lord; we cannot speak to you bad or good. Behold, Rebekah is before you; take her and go, and let her be the wife of your master's son, as the Lord has spoken." When Abraham's servant heard their words, he bowed himself to the earth before the Lord. And the servant brought out jewelry of silver and of gold, and garments, and gave them to Rebekah. He also gave to her brother and to her mother costly ornaments. And he and the men who were with him ate and drank, and they spent the night there. Bethuel, Rebekah's father, speaks for the first time along with her brother Laban. Laban has been acting with the authority so far; this is quite unusual and we might infer that Bethuel has become feeble. But Bethuel is present along with Laban for the official consent, to give his blessing. And oddly, they do not say "It is the will of the Lord, we agree"; rather, because it is the will of the Lord, they simply obey, offering no other opinion. And Abraham's servant bows, not to them, but to God. But Abraham will treat them properly. In most civilizations, money trades hands between families at the time of a marriage, although, rather weirdly, it is sometimes the groom's parents who pay a bride price to the bride's, and sometimes the other way around (most notably, in India, where dowry was so important that a law forbidding it was passed in 1961). 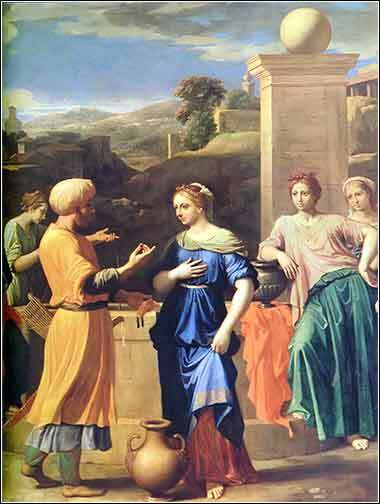 We have seen before that the custom in the Middle East at this time was for the bride to be bought, so Abraham gives costly items to Rebekah's mother and brother. He also pays a sizable amount to Rebekah herself. This is called "dower" and is surprisingly advanced for the day.